The Sea: A Common Good is the theme of this ninth edition, organized as in previous years by Slow Food and the Region of Liguria. The focus is on positive messages, looking at the good practices that can help us ensure a better future and showing how consumers, fishers, chefs and scientists all have a role to play in protecting the sea, a complex and delicate shared resource whose health depends on our common care. 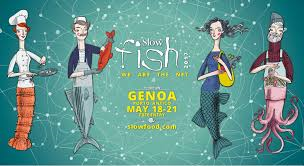 Slow Fish will take place in the beautiful setting of the Porto Antico, the city’s old port, a few steps from its historic centre and the heart and soul of its seafaring identity. As the city and its region face unprecedented challenges, more than ever before Slow Food wants to promote this area and make it an active player in Slow Fish. The connection between environmental, social and gastronomic issues has always been particularly strong at Slow Fish. The focus for the 2019 edition will be on virtuous behaviours that can help to mitigate our impact on global warming, as well as the fight against single-use plastic, conscious choices we can make that are good for our palates and our health, food security and the most common frauds, the importance of reading food labels, biodiversity and forms of clean aquaculture.